Nedalliae is the meta-form of Medalliae. In several ways, it parallels the metamorphosis of its counterpart Rogon, coming down from the trees to live primarily on the ground. 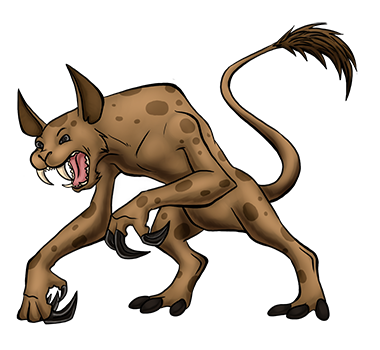 However, it changes from an omnivore to a carnivore instead, and rather than compete with Rogon, it preys on it. Its claws are too long to keep retracted, so it walks on its knuckles to prevent them from getting dull. It will use its powerful forelimbs to grapple its prey before dispatching it in a single bite with its sabre teeth. The continued connection between the Gogon/Rogon and Medalliae/Nedalliae species is also an added plus.